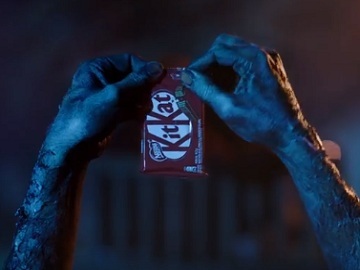 KitKat has released its Halloween 2017 commercial, urging viewers to have a break from the usual this Halloween. The spot features a young couple on a night date in a cemetery, stopping for a few moments on a bench, among graves. As they are giggling, a corpse from a grave behind them is seen getting out of the ground (actually only his hands are seen) and stealing from the girl’s bag, which lies on the ground, near the bench, a KitKar bar. After enjoying every little piece of it, the dead body, belonging to a person deceased in 2017, returns into its grave taking also the wrapper. The commercial ends abruptly, with a black screen. In 2016, KitKat brand’s Halloween commercial, created by ad agency Anomaly, New York, featured the “Kat Lady”, whose house is loved by kids because it’s full of cats and Kit Kat bars.